"Perfect size for our kennel." Perfect size for our kennel. "Now my doggie doesn't have to be thirsty all night." Works pretty good -- just make sure you use a wrench to tighten the bolt. Now my doggie doesn't have to be thirsty all night. The included bracket does not work well on a standard chain link fence, the brackets are not long enough. I used a drill to make a hole in a wooden post and screwed the bolt in, works great. It broke the first day. Spot weld was broke. I to get it welded again and make stronger and longer pieces to clamp with. 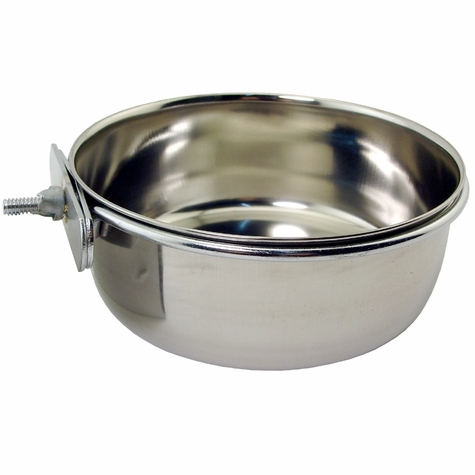 Stainless steel water bowl / cup clamps to wall, fence or crate door.